Every year before our Winter Concert, we publish a 45-50 page yearbook of our singers and the families who support them. The Yearbook reaches over 3000 supporters! 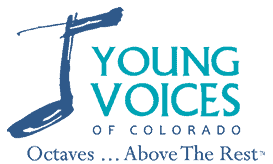 This is a perfect way for businesses to support the Littleton-Englewood-Centennial-Denver-Highlands Ranch communities and the Young Voices program by getting their business name out there and encouraging new business. Our choir families show their appreciation of business support by frequenting the businesses advertising in our yearbook. It’s a double win for all! To Advertise in the 2019-2020 Yearbook, please submit this form by October 13, 2019. Your valuable support ensures our success! We cannot publish our wonderful Yearbook without your assistance. If you have questions about placing an ad, please email Chrys or call her at 303.797.7464. Ad Format CAMERA READY art in a jpg file. Please upload pictures that are a minimum of 300 dpi and 600 dpi if possible. A proof of your ad will be emailed to you for final approval at the end of October. Ad design is complimentary with purchase. A graphic artist will design your ad for you. A proof of your ad will be emailed to you for final approval at the end of October. Please upload pictures that are a minimum of 300 dpi and 600 dpi if possible. Thank you to these businesses who have supported us through our fundraising events and yearbook advertising.